The great Mardi Himal Adventure! We depart Landruk amidst friendly waves and good wishes. Local folks are getting a kick out of us taking a proper Nepali trail in leu of a tourist route. It takes only a few minutes to cut in behind our guest house kitchen and through some rice fields to a set of stone steps leading up the slope behind the village. I’m pleasantly surprised by the steps. I’d expected a goat track. However very soon the steps disappear and the trail becomes rough and then rougher. Steep and then steeper. There are some places where I give Tendi my poles and I clamber up rocky sections. We stop a few times for water breaks and a cookie break and to admire the opening view. Before long Landruk is a tiny toy village way below us. The weather is warm and sunny and I’m quite glad when we enter the cool shade of the forest. The forest also helps disguise the steep cliffs below us. There are a few spots where the trail is very narrow and the drop below is quite frankly terrifying. A few bits of the trail traverse the slope around impassible outcrops of rock. But steadily we gain altitude and after about three hours we come out onto the top of the ridge. We’re still surrounded by the forest with its insect chorus and bird song. We’ve passed by orchids and ferns large and small. There is a peaceful magical quality to the place. I’ve forgotten to mention the numerous butterflies we see in the forests. They are all quite small but their colours and colour combinations and patterns are truly extraordinary. Bright blue with black trim. Orange with brown and black dots. Yellow stripes with red. The assortment seems limitless. These lovely creatures are flitting about here too, their wings catching the light of the sun as it threads through the branches above us. I’ve enjoyed every challenging moment of today’s adventure and it only gets better as, through the trees, we spot the roof tops of Forest Camp. This is a collection of three little guest houses surrounding a flat well cropped meadow which is encircled by a rough fence. We choose a pretty stone place with flowers planted along its sunny slate porch. It is a simple guesthouse but there is a massive stove in the middle of the dining room. While it’s really warm and sunny for some time after our arrival, the afternoon clouds eventually pile up, obscure the sun and result in a considerable drop in temperature. A very quiet Australian woman arrives. She doesn’t seem sociable but at dinner she joins me at my table and we chat for the cozy evening by the fire. We wake to glorious sunshine. Because we’re surrounded by forest there are no mountain views but they are to be had just above us! We set off a bit later than usual for a short uphill trek to Low Camp and arrive in less than three hours on an open sunny meadow bordered by two very humble places in which to stay. I’m a bit dismayed to note how far the outhouses are from the rooms. Tendi picks the high side guest house. The Aussie lady and eventually an American lady go to the lower one. Two young Russians show up at mine. It’s nice the custom is being spread between the two but it turns out Tendi has picked the superior place. Our cook is better, our roofs don’t leak, our beds don’t collapse in the night and our dining room is cozier. That said – the rooms have mud floors with frayed rush mats. There are wooden shutters but no glass in the windows. The mud floored kitchen and dining room are very small, and equipped with rustic home crafted benches and tables. The table cloths are filthy beyond description. But there is a stove in the dining area. This place is pretty basic by Nepali trekking route standards. It doesn’t have the ambiance of Forest Camp, but it as an odd sort of appeal and there are no crowds! The afternoon weather is a mix of fog and sun, glimpses of Fish Tail peak right next to us come and go as the fog swirls around. We three women take turns sitting at each other’s “places”. It’s odd to come across single women travelling with a guide and porter like I do and here there are three of us. The Aussie, Miriam and I have some rum in our tea. Tendi has scored this for her on the QT as she thinks her guide and porter are non-imbibers. Later I spend the evening very cozy by our stove chatting with the Russian couple. They are charming and I have an invite to visit them. The owner of our establishment is a very rough looking fellow who is a great cook, speaks excellent English and is a gem of a host. Just goes to show a book should never be judged by its cover. The kitchen with owner and cook at Low Camp. Seriously. 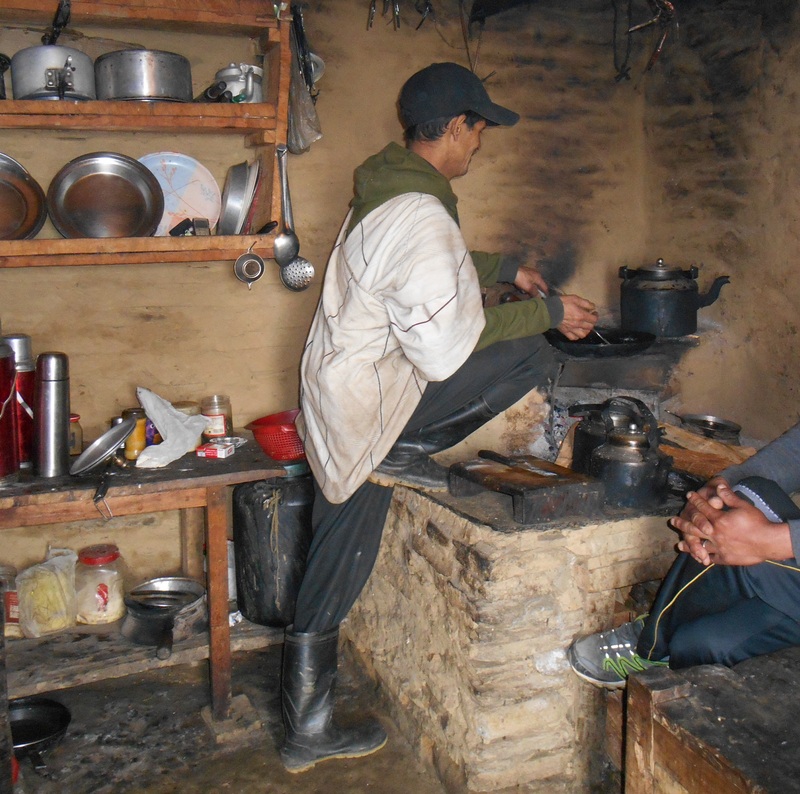 But the food was great and his Masala tea the best on the trek. The forecasted poor weather has shown up. This morning was foggy and it has remained so for most of the day. We are now all at High Camp and have spent a pretty cold afternoon. The hike up here was fantastic. We started in the forest but after about an hour we suddenly came up into a high alpine grass land. The ridge we’d been climbing became ever more narrow and steep. The scenery on either side was often obscured but the fog shifted around enough for us to get occasional sightings of Annapurna South and Fish Tail. Both peaks seem touch-ably close. There was a bit of clambering on steeper sections of the trail but mostly it was just a stiff up hill trek for about three hours. Thankfully this place is quite a bit nicer than last night’s digs. Here the rooms have stone floors. The outhouse is quite rickety with a door that doesn’t really close but it’s a bit closer to the rooms, although there are some rough uneven steps to negotiate, and its on the edge of a cliff. Again there is no window glass in the rooms, just wooden shutters. If one wishes natural light, one opens the shutters and door. That also enables the damp fog and cold wind to swirl on in. So total darkness cut by flashlight works because of course there are no lights. The dining room is cheery and one of its decorations is a massive set of yak horns with furry scull. Quite hideous! When the fog lifts, which it does from time to time, we have stunning views of the nearby peaks. This afternoon’s entertainment is being provided by Tendi, Furi (My porter since Tsheri went back to school) and another guide as they sing mountain folk songs. This has been the habit for the past three days and it’s quite wonderful. Down at Forest Camp they found a drum which Furi and a shepherd took turns with. Yesterday they had some sort of stringed instrument. Today it seems they have only their voices but as they all sing beautifully this isn’t too much of a hardship. And so an Aussie, two Russians, six Nepali and a Canadian are all happily nestled at about 3700 meters in a tiny stone walled room in a fog shrouded world under one (perhaps the only) unclimbed peak in the Himalaya – Fish Tail. This Mardi Himal trek has presented several special surprises and joys. The scenery is outstandingly glorious. I’d love to come again in the spring when the Rhodes are blooming. The ridge we are on is providing us with truly intimate views of the great peaks. Instead of being way down in a valley looking up at them from a distance we have the sensation of being with them. I’m very much enjoying the more personal experience of spending time away from the major tourist routes. Perhaps this is how trekking was back in the day? Plus there’s the satisfaction of having embarked on an unscripted adventure. Mardi Himal (by the way) is a small peak next to Fish Tail which, while not particularly famous, offers some good technical climbing. And thus this lovely trail to the Mardi Himal base camp. Tendi and I are up and have had tea by 6:30. We set off for a short climb up to a view point above High Camp. The valleys on either side of our ridge are boiling with cloud and as soon as the sun starts warming these upper slopes that cloud will rise up and obscure out perfect views of the peaks. The clear skies will not remain so for very long. The early morning light angles horizontally across the grasses of the ridge and soon steam is rising from the melting frost. Our climb is a quick one. We enjoy the views, take a few minutes to marvel at the beauty of the moment then descend for breakfast. No sooner are we back at High Camp when the tendrils of fog reach up, obscure peaks and sun, and the chill damp sets in again. We eat a quick breakfast and begin our trip back down to Forest Camp. The walking warms us up which is good because the fog becomes more and more dense as we descend. We arrive just before the rain begins! The Aussie and the Russians weren’t so quick off the mark this morning. Where ever they are they are getting wet. This evening I enjoy dinner with a young Dutch couple. The fire in the dining room has everyone toasty warm. The Nepali are singing again and there are several instruments this evening plus an vigorously barking dog. We could do without the dog. A warm bright sunny day. We said goodbye to Forest Camp and continued on down the ridge. Within four hours we were in Pothana and had rejoined one of the major trekking routes. It’s all fine though. I’ve enjoyed our diversion and the hot shower followed by a cold beer was really really nice! Running water in a sink is also a treat! Nothing like doing without a few creature comforts for a few days to gain a real appreciation for such things! None of the three camps had running water! Needless to say my hand sanitizer came in very handy! Hard to believe that this trek is almost over. Just two more short days on the trail. Then back to the chaos of Kathmandu. What an adventurer you are.. Our trek into Everest Base Camp was tame by comparison! I think getting away from the well traveled tourist routes is an added bonus. It seems to me you have acquired credibility and admiration of the other guides and local Nepalese. These unexpected changes add to your adventures! I wonder if the guides become bored with having to travel the same old routes? One of our most memorable evenings was when the guides and some locals etc brought their instruments and began singing and dancing. It was so special. Too bad other travelers find it annoying! Can’t imagine that.. Once you are home and rested I would like to follow your routes on a map. Till then travel safely. Karin will have arrived in Katmandu by now. Happy teaching you two. Good morning Brenda. Indeed we can pour over my map and my 2000 pictures when I get home. Karin is in Chitwan. Then she goes to Pokhara and she gets here the evening of 14 Nov. I’m picking her up on the 15th and bringing her to my hotel. On the 17th we head off to Tendi’s village for six days. I start school today. Looking forward to it. I have grades 7 to 10 this year, so it will be a new challenge.